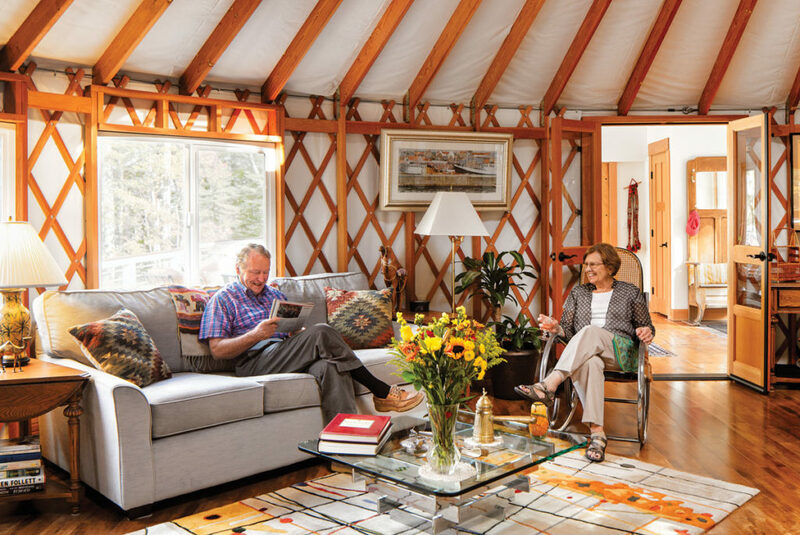 A Surry couple finds peace, and an intimate connection to their waterfront plot, in a pair of linked yurts. 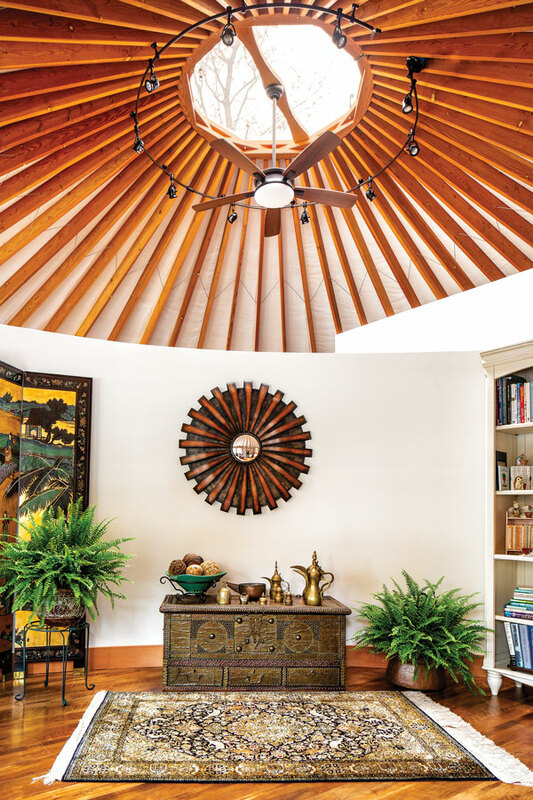 Composed of a circular, domed tent stretched over a collapsible lattice framework, yurts were first used thousands of years ago by Mongolian nomads. 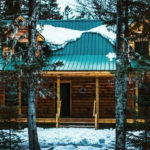 Today’s models are highly durable, with some able to withstand snow loads of up to 100 pounds per square foot and winds of up to 142 miles per hour. Their round shape promotes air circulation, their materials are largely recyclable, and most can be assembled, or taken down, in a few hours or days. The couple’s choice of glass windows over the lattice-covered Plexiglass typically seen on yurts pays off every time they take in their 180-degree bay views. In 2015, she ordered two 30-foot structures from Pacific Yurts in Oregon for $22,000 apiece, not including interior walls and floors. The oldest yurt manufacturer in the country, it’s also the only one she found that put square glass windows in a round home. Originally, she wanted two buildings connected by a long walkway on a platform. Her contractors balked at the platform part though. Securing the necessary support posts would be so costly, they said, that it would be barely more expensive to build a basement. So she decided to incorporate a walk-out lower level. The change meant leaving a bigger footprint than she’d planned and returning to her old job in a hospital operating room — at age 74, she notes — to cover the extra cost. But the basement also created a new revenue stream: the additional space allows the couple to decamp to a bedroom down there and rent the yurts on Airbnb. Plus, the house can now accommodate their entire 16-member family. LEFT Sharon wanted a luxurious tub to soak in after long days at the hospital, where she works per diem. On the wall is a Panamanian textile known as a mola. RIGHT A Kuwaiti chest in a sitting room off the bedroom displays brass and copper Arabic coffee pots and bells. By all appearances, Sharon could not be more delighted with her hybrid home. “What I really like is when you come down the driveway, it just looks like two tents! You’d never guess what it looks like from the other side,” she says, referring to the large windows and wraparound deck on the water-facing façade. 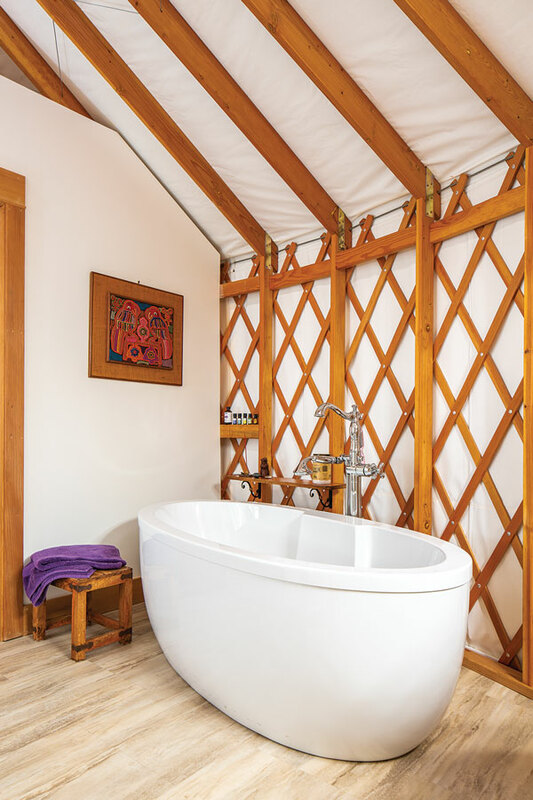 One of her sons-in-law calls the place “the Taj Mahal of yurts.” The master bath has a freestanding tub with jets and a European-style toilet with a built-in bidet. 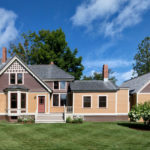 Both floors have radiant heat and the master bedroom has a heat pump. Sharon and Tom are approaching their third winter here, and they allow that in the kitchen, where there isn’t yet supplemental heat, it can get a little cold. After all, the only things standing between them and the elements are some sheets of polyester over a thin layer of reflective insulation. (“They use it on spaceships!” Tom interjects. But still.) They’re planning to get a second heat pump for the kitchen, mostly for the benefit of the Airbnb guests, and in the meantime, they just layer up.